A reliable source for Kraft Tubes information and a resource for accessing leading Kraft Tubes and suppliers. Kraft tubes are cylindrical, hollow tube products made out of kraft paper, a type of cardboard composed of wood pulp and sulfate additives. Kraft paper is coarse and naturally a dark brown color, although it may be bleached to obtain a lighter surface color. Compared to other types of paper, kraft paper is stronger and able to withstand more pressure. However, it is also slightly more expensive than other types of papers and so is typically only used when a more durable material is needed. Kraft Tubes Kraft tubes are cylindrical, hollow tube products made out of kraft paper, a type of cardboard composed of wood pulp and sulfate additives. Kraft paper is coarse and naturally a dark brown color, although it may be bleached to obtain a lighter surface color. Kraft tubes are most often used in shipping, mailing and packaging applications to safely transport posters, blueprints, unframed artwork, calendars, promotional materials, banners, large documents, and any rolled material that cannot be folded or packed into a cardboard box. The paper cores of toilet paper and paper towels are often made of low quality kraft paper. The outside of coin banks are usually covered in kraft paper which has been printed on for a decorative and colorful look. 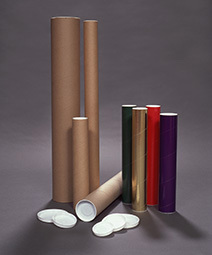 Kraft tubes are also sometimes used for long-term document storage and protection. Cardboard tubes made of kraft paper are constructed in a similar way to other types of postal tubes. Firstly, large sheets of kraft paper are cut into thin ribbons which are then coated in adhesive and wrapped on an angle around a mandrel of the desired shape. They either have crimped ends that fold shut to secure the ends of the tube, or snap-on plastic, metal or wooden caps that snugly block both ends, keeping the products securely inside. Tubes come in many different shapes and sizes, to accommodate the various types of products they hold. All paper tubes are measured and defined by their interior dimensions rather than exterior, and are typically no longer than 48 inches. For heavy duty applications, dielectric kraft paper, which is pre-impregnated with phenolic resin, is used when high strength, waterproof and resistant cardboard is needed. The wood pulp-resin mix is formed and cured, followed by further curing in an oven. While post forming heat treatments take place, the phenolic and adhesives coalesce. The finished product is thinner and stronger than standard kraft, and holds its shape better in humidity or when affected by elements of weather.